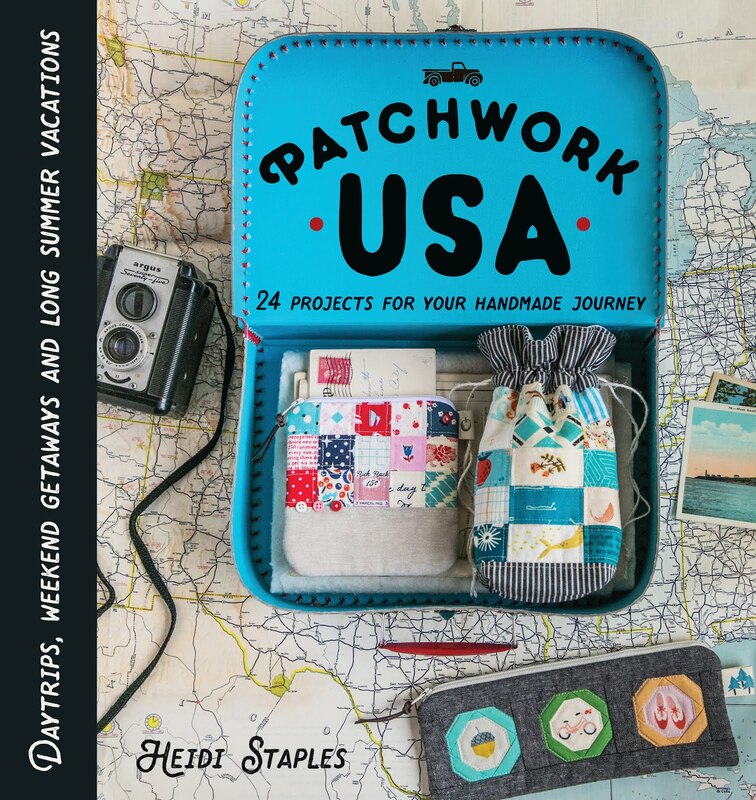 So as I said a while back, even though the blog hop is over, Girl Friday Sews type projects are going to be coming by here every once in a while to visit. My Bunny is finishing up another year of her AWANA Bible club in the next two weeks, and I'm trying to finish a few gifts for her teachers. Last year I made these portfolios which were a big hit. This year I'm giving them an Office in a Pouch. The pattern isn't mine -- I based it entirely on Ayumi's adorable Patchwork Wristlet, enlarging it to a 9 x 14" size and forgoing the patchwork to save time. I added an extra layer of interfacing in the lining to help with stability since I was making it larger and not doing any quilting on the exterior. The darling hippo fabric came in a scrap pack from Fabricworm -- best scrap packs out there, people. You will not be sorry if you order one of these, I promise you. 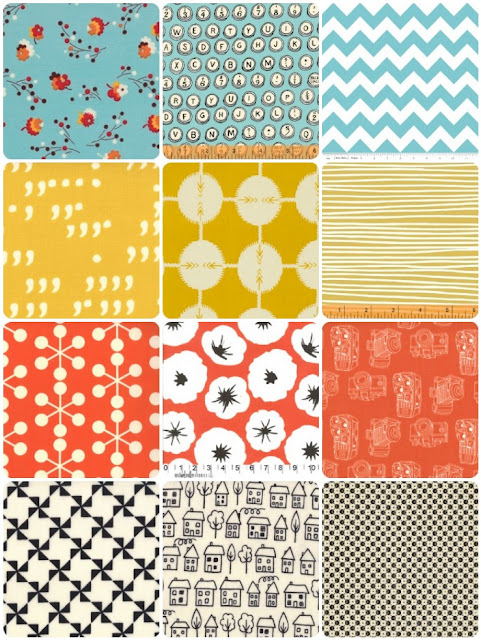 The lining fabrics are both from Comma by Zen Chic, such a great line full of incredibly versatile blenders. When I showed the pouch to my husband, he asked, "What does milk have to do with hippos?" I smiled and answered, "Nothing, except that it's completely adorable." I'm filling my pouches with office supplies: a pen, paper clips, binder clips, post-it notes, washi tape, and a small journal. There's still room for receipts, bills, stamps, lists -- all those things that can so easily sink to the bottom of a purse and get lost forever. I'll have pictures of the other three pouches to share in a day or two. Several of you asked for a tutorial for my patchwork bag also, so I'll be putting that together this week as well. Thanks for the encouragement! Birthday week marches on in our family: my niece, my sister-in-law, and now Tuesday is my sister's big day. This little bag had quite the roundabout path to the finish line. First it was going to be the makeup pouch from Patchwork Play, but I cut my charm squares wrong by accident so that was out. Then I decided to make a simple zipper pouch...which then became a quilted pouch...which then became a wristlet...which ended up as a purse with handles and a gusset. It took me all afternoon, but I had such a good time playing around with this design. Next time I need to add a layer of heavy interfacing in there to make it a little stiffer, but otherwise I love the way it turned out. The yarn dyed black Essex linen paired perfectly with squares from a charm pack of Happy-Go-Lucky by Bonnie and Camille. I think this is my favorite line of theirs yet. The navy prints are wonderful, and I love the vintage feel of the entire collection. I will definitely be buying yardage when it comes out. The inside of the bag is an old print by Denyse Schmidt, and I bound the inner raw edges with Kona Grass. I stuffed it full of cute office supplies from Target and added a Fabricworm gift certificate for good measure. Last week I picked up a few charms at the local Hobby Lobby to use on my zippers in some upcoming projects, and this was my first chance to use one. I adore these little red glasses and have another pair leftover for next time. I love it when sewing is fun! My sister-in-law's birthday is tomorrow, and though I'm late with her gift this year, it's a good one. I've already extolled the virtues of the two Melford Messenger Bags I've made in the past year here and here, so I won't bore you with the same spiel again. This time I tried to simplify the bag a bit more, removing the outer pocket and buttons so that they wouldn't compete with Anna Maria Horner's glorious new Parenthetical linen print. I also used a velcro closure this time instead of a snap. The purse and strap are lined in Pressed Field Peony from the same linen collection. I have more of these prints on hand which I hope to make into a larger summer bag soon. I can't recommend this fabric highly enough. My dad is retiring this Sunday after twelve years as the pastor of his current church. We're all so proud of him and excited to be celebrating this milestone through special gatherings over the next two days with friends and family. When he and my mom were cleaning out his office over the past two weeks, I suddenly looked at his desk and said, "This would make a fantastic sewing table!" My dad was sweet enough to let me have it, and we all can't believe how perfectly it works. I used it for the first time yesterday, and it was absolutely dreamy to have so much space to stretch out and work. After a four year hiatus, I have a smartphone again, much to my delight. The best part of this, of course, is that now I get to be on Instagram. You can find me by clicking the button on the left side of this screen or by just going here. I'm having a ball trying out this fun new way to stay in touch. And finally, my deepest thanks to all of you who sent such kind encouraging words and prayers about my husband's medical issues last weekend. Yesterday he went in for a heart ultrasound and an appointment with a cardiologist to discuss his atrial fibrillation. When they tested him, they could find nothing wrong with his heart at all. Not a thing. They're doing some further testing to confirm it, but it looks very much like he's going to be just fine. I can't begin to tell you how grateful we are for such wonderfully miraculous news. my picks -- love this color combination! Rachel's having a "Sweet Contrary" mosaic contest over on her blog this week, sponsored by Lark Cottons. I always love putting together these virtual bundles, even though it's not as easy to do when the fabric is on your screen instead of in your hands. There are a ton of fabulous entries over there right now, so if you're looking for spring ideas, this is the place to be. Go check it out! Pop over to Cindy's lovely blog Live a Colorful Life this morning to hear all about how Fabric Mutt got its name. Our interview happened this past winter, so I actually celebrated my first year of blogging at the end of December. Where does the time go?? I can honestly say that I'm enjoying myself more than ever these days, and no small part of that is due to all of you. Yesterday we had a wonderful time celebrating my niece's third birthday at a family party. Knowing how all the girls love to carry things around in bags and pouches, I decided to pack her present in this little box bag. You can make one for yourself using this tutorial, but I warn you, they're addictive. I've already picked out the fabric to make a few more of these. I've been saving a fat quarter bundle of Fox Hollow by Monaluna for something special, and this was it. I love these sweet little prints. How adorable is that little fox on the zipper tab?! As many of you know, my husband teaches advanced history classes for junior high students at a nearby middle school. On Monday, to help the kids get in the right frame of mind for their standardized testing, his school held "Dress for Success Day." My husband and a few of his coworkers decided that this occasion definitely called for bow ties. Rather than spend forty dollars for one at the mall, he asked if I could possibly make one. Martha Stewart had a nice little pattern on her website, and I was able to make two of them for him to use this week. It's really a very easy project if you don't count the part where you turn the tie right side out -- yikes. My husband liked the first two so much that he asked for more, and the dress up day has stretched into a full week as far as he's concerned. Doesn't he look dapper? At the moment, I have a stack of fabric on my desk right now that he picked out which is set aside for bow tie purposes. One of my fabric auditions finally got the part: Breakfast in Bed is now a happy little runner for our dining room table. I played with the bundle a bit more before I finally settled on the right mix of three inch squares. I used black yarn dyed Essex linen on the sides, two strips of Chicopee that I pulled from a jelly roll for the binding, and some Happy Dishes by Melody Miller for the back. It's a rather quirky side of spring, but I like it just fine. I love these little ducklings by Heather Ross. 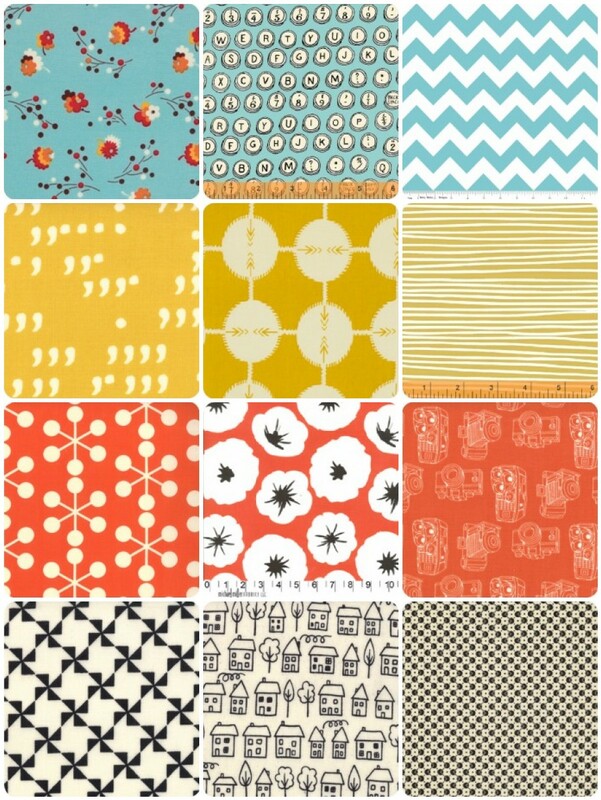 Somehow they didn't make the cut for Nursery Versery, but I've been wanting them ever since I first saw them on Spoonflower. Speaking of Heather Ross, have you seen the news about the Briar Rose contest that's being sponsored by Pink Castle Fabrics, Threadbias, and Windham Fabrics? Create a lap quilt using the new quilt design tool at Threadbias for a shot at enough Briar Rose fabric to actually make the quilt. I'm absolutely loving her latest fabric collection, so of course I jumped right in this afternoon and put together the design you see above. 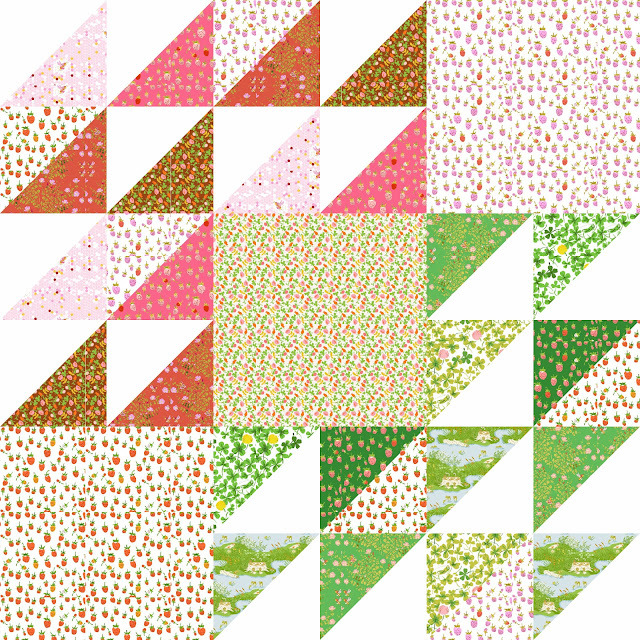 This was my first chance to play with the quilt design tool, though I've heard plenty about it in the past few months. It only took me a few minutes to get the hang of it, and I can absolutely see why people are excited about this little gadget. Just pop over to the Pink Castle Fabrics blog here to get all the details about the contest. It's free, it's fun, and you get to play with virtual Heather Ross fabric. What could be better than that? These ladies are all incredibly talented, and I'm so grateful to them for taking the time to share their creativity with us. You are amazing, my friends! I can't thank our generous sponsors enough: Craftsy, Fabricworm, Pink Chalk Fabrics, Sew Me a Song, and Westwood Acres. Please stop by and check out what these wonderful shops have to offer. I promise you won't be disappointed. 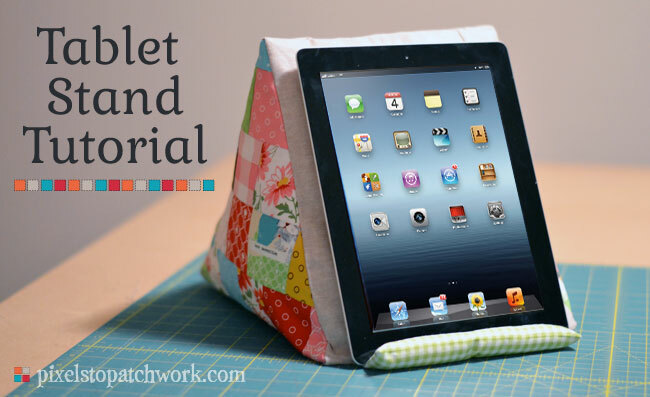 From time to time, you'll be seeing more Girl Friday Sews tutorials here on Fabric Mutt, because honestly I just love making projects for our work spaces here at home. 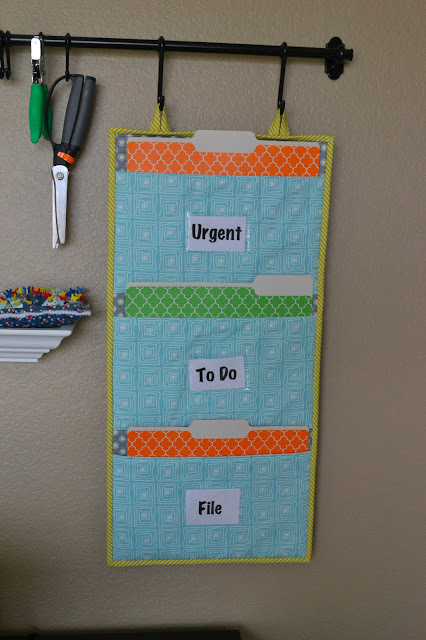 I'll have them linked on my Tutorials page as well as on the Sew Along page so that you can find them when you have your next office supply emergency. Seriously, though, pick a project from the list above and make something fun for your desk this week. You won't believe the difference it can make. I am so in love with the colors and prints in this little bundle. 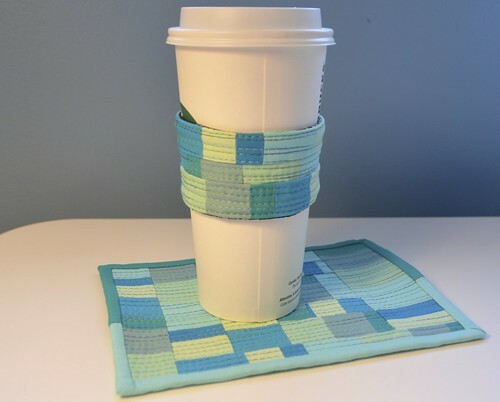 Wouldn't this make a wonderful table runner for spring? 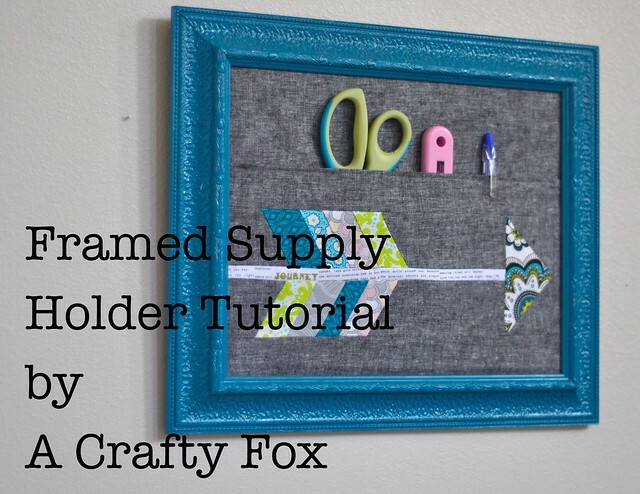 I have been so excited about the tutorials that my friends have shared in the Girl Friday Sews Blog Hop these past two weeks. 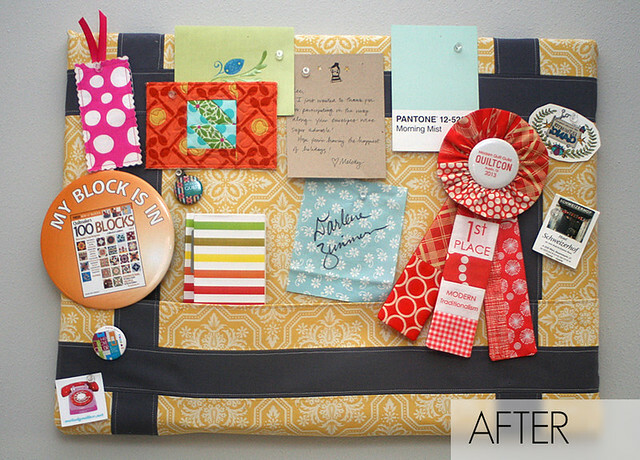 Since the last time I posted on here, Lee shared a fantastic cork board makeover, Svetlana showed an adorable way to store your pens, and today Beth has a tutorial posted for making a darling messenger bag (and a giveaway too!). 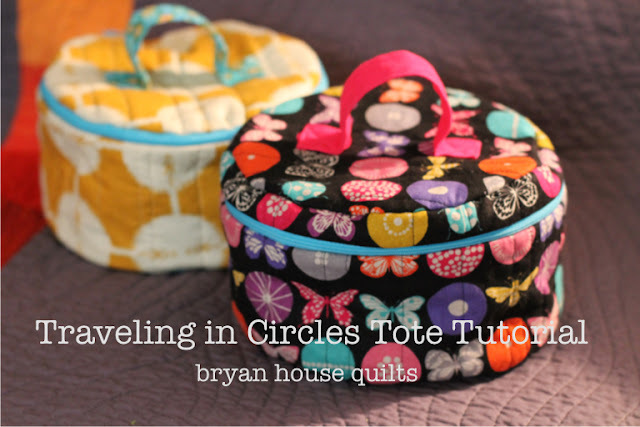 Last week, Becca shared the Traveling in Circles Tote -- a simply brilliant tutorial for an incredibly useful little storage bag. To make a long story short, I used a 24" zipper instead of a 22" one. Who would have thought that two inches could make such a difference? I didn't see the impending disaster until last night when I was putting the final pieces together. For a moment, I wanted to chuck the whole thing and start over -- I couldn't see any way to erase my mistake without taking the whole thing apart, and that just wasn't going to happen. And then I thought, why should I trash this little bag? After a few minutes of thought, I figured out a way that I could fix the issue enough that the bag would actually work. It wouldn't be perfect, but it would work. And I could live with less than perfect, couldn't I? It happened this week -- the thing I've been dreading. My little Mouse suddenly became aware that her room is dark at night and that darkness is sort of, well, scary. I've been in with her three or four times each night as she wakes up crying from bad dreams that she can't completely remember. Now she won't let me put her down for a nap without looking at me with those big, blue, tear-filled eyes and pleading, "Mommy, will you wock me and sing a song foh me?" So we rock and I sing and then she cries quietly when I finally tuck her in bed. It's the stuff of life that every child goes through, yet it still tears at the heart of a mother. To help her cope with it all (and me too, I suppose), I decided to make her a special lovey to keep with her when it's nappy time. My friend Lori held a low volume print charm swap a while back, and I was so happy to finally dig into the pile I've been keeping in my cabinet. I mixed in a few brighter prints to balance it all out, backed it in an American Jane print, and quilted it all over with a wavy stitch on my machine. The binding is made up of leftover scraps from previous projects. It's a simple little quilt, and really that's all it needs to be. I've always told my girls that when they're wrapped up in one of my quilts, they're all wrapped up in Mommy's love. Hopefully we can all sleep better tonight...especially this precious little girl. A look at the lighter side (if such a thing exists) of upcoming tax day... I do so love those prints from Type by Julia Rothman. 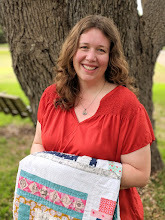 Amanda has a perfectly charming project to share with you today for the Girl Friday Sews Blog Hop along with a giveaway from her darling Etsy shop. I, like the rest of the world, am a big fan of Westwood Acres, which is chock full of lovely bundles right now. Drop by and check it out! 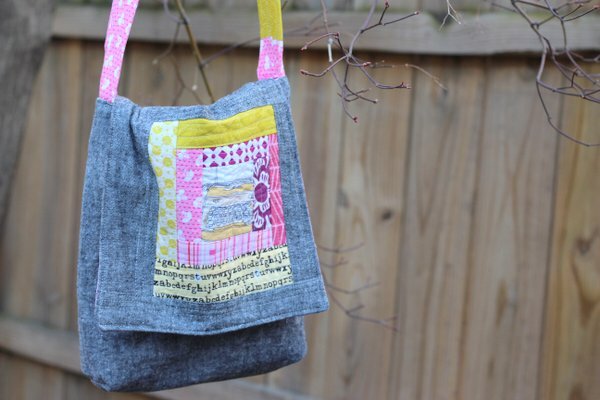 Girl Friday Sews is in full swing with more great posts. Kristy shared a darling pencil pouch yesterday, and Becca has a fabulous tutorial for a traveling zipper tote that will be posted later today (she's got a flu bug on the loose at her house, but she's promised to have that post ready for you this afternoon -- what a trooper!). 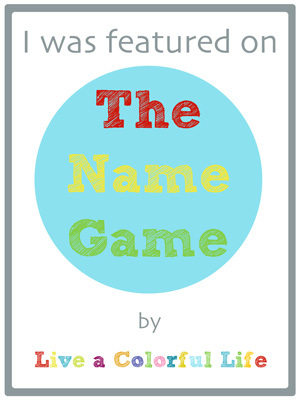 Be sure to stop by both of their blogs for a look if you haven't already. I have to tell you that I'm loving my new desk blotter, and I can't wait to see what else I'll be making by the end of this blog hop!